Earlier this year I put together a trio of skincare-related videos in order to paint a comprehensive picture of my current skincare. A few updates have happened along the way - some products weren't working for me and others were used up - so I wanted to touch base and keep you in the loop on what's changed in my morning routine. When it comes to skincare, I'm all about light textures and effective ingredients for my combination/oily, acne prone skin - think salicylic acid, niacinamide, lactic acid, Vitamin C and a healthy dose of hyaluronic acid. One thing that has changed since the routine in the video above is the introduction of the Ole Henriksen Banana Bright Eye Creme on top of the NIOD serum. I absolutely love the way this cream feels under my eyes and I swear it helps my makeup apply and perform better throughout the day. It's a winner for sure. I also used up the Bidoerma Hydrabio Serum and Avene Thermal Water. While I will buy both of them again in the future, I wanted to change it up: I purchased a bottle of Caudalie Grape Water and received the Zorah C-Nature serum to try out. The latter is fragrance free and contains Vitamin C (sodium ascorbyl phosphate) along argan oil and sodium hyaluronate to keep skin hydrated and bright. I also love that they're an all natural & organic Canadian brand. For moisturizer, I stopped using PCA Clearskin as my skin wasn't reacting well to it. I am currently using up deluxe samples of Ren Global Protection Day Cream and Clinique Moisture Surge Extended Thirst Relief in its place - love them both. I found that staying consistent with products and having a stable, reliable routine has made such a big difference in my skin. It's easy to get discouraged when experiencing a breakout and it's even easier to get tempted to try the hundreds of new products being launched every week. Improving skin condition takes time and patience, and respecting the skin's integrity by being gentle has been a very valuable lesson for me. What products are you loving during the day? 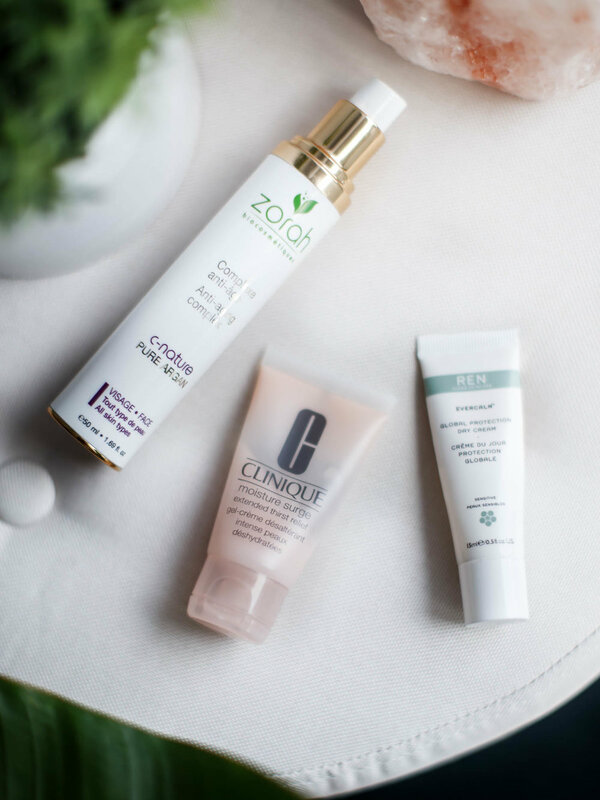 New Skincare Goodies & more!